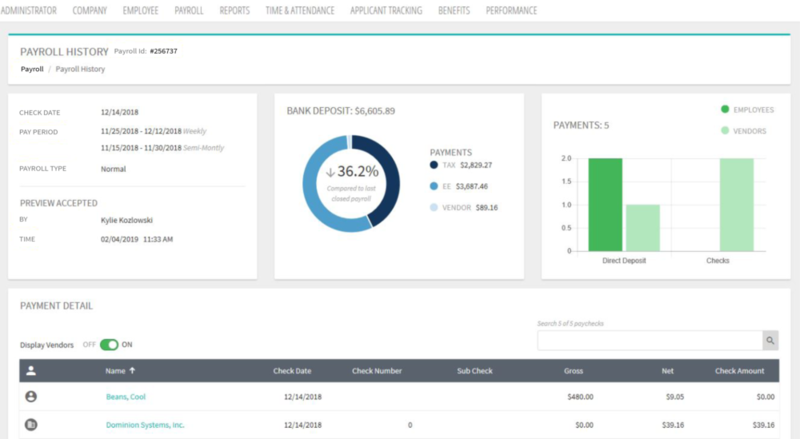 A widget that provides the total breakdown of tax payments, employee payments, and vendor payments. You will be able to toggle the option to have your vendors included in this data or keep it focused solely on your employees. Clients now have the ability to send out emails through their Applicant Tracking System from their own email addresses, rather than the standard DoNotReply@dominionsystems.com that it defaults to. If you would like to do this, add the desired email address within the text box on the Email Templates page. Once that has been added, you will be prompted to add in information that allows your mail to be sent through your SMTP (Simple Mail Transfer Protocol) server. If you do not add in a custom email address, it will default to the normal DoNotReply email. You’ll also notice that it’s easier than ever to add questions on the fly while setting up your application. Simply click the +Question button at the bottom-right of the card to further improve the efficiency of your application process. Finally, there is a new addition that offers the ability to simultaneously look at both the applicant and the application. Down the road, you will be able to use this page to not only review the application but also decide what action to take with the application.